This recipe comes from the farm that grows them, since they would probably know best. No, they are not cucumbers that have hidden under the leaves away from sunlight, so they would not turn green, like a vegetal vampire. It is a varietal on its own. They are actually tinged a light lemon yellow, rather than pure white. They taste relatively the same as green cucumbers, though some would say they are sweeter or milder in flavor. Though they look like they have already been peeled, you may want to peel them if they are at all tough or bitter. Similarly, scoop out the seeds with the spoon if you prefer. These white cucumbers found at the Half Moon Bay Farmer’s Market were nestled right next to its green counterpart and selling for the same price, 50 cents each. Daylight Farm kindly posted a recipe right on top of the crate they were packed in. Since they grow, harvest, and sell the cucumbers, wouldn’t they know how best to prepare them? Interestingly enough, they have presented an Asian inspired dressing: a simple marinade of salt, sugar, soy sauce, and rice vinegar. Top with a garnish of toasted sesame seeds. You can even make this ahead of time or double the batch and snack on it for a couple days. Try this alternate cucumber recipe, that simultaneously relieves aggression and uses Japanese cucumbers. Published on October 31, 2018. 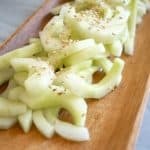 Adapted from the recipe from Daylight Farm in Half Moon Bay, CA, this simple marinade can be used on any type of cucumber. Use white ones though, if you can find them. Mix all ingredients together, except sesame seeds. Let sit for 5 minutes then stir again to make sure the salt and sugar are dissolved. Top with garnish of sesame seeds. Make ahead up to 2 days. 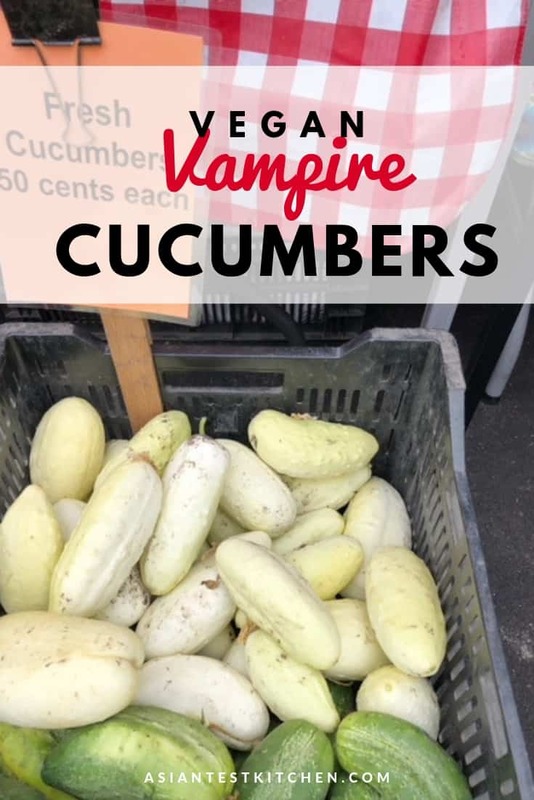 Do you like the sound of vegan vampire white cucumbers? Please spread the Asian ♥ and share!